Including, but by no means limited to, the various iPod models, there are currently dozens of portable music players out there – hundreds if you include mobile phones, most of which have some kind of music-playing capability. Many of them give very decent results, but they're not really Hi-Fi with capital letters: commodity consumer electronics, more like. The Colorfly is something a bit different. 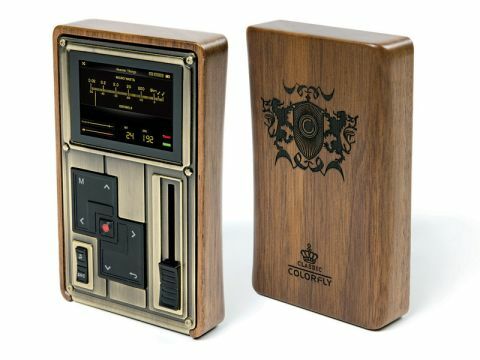 It's a portable music player all right, but it's aimed fair and square at the true audiophile, the individual who owns a carefully selected system of high-quality components and a decent library of recordings. It is an expensive item as portable music players go, but even at three times the price of an iPod Classic it's far from ruinous when one considers its abilities and possibilities. The most significant feature is its high-resolution capability: not only CD-format WAV files, but native or losslessly compressed files up to 24-bit/192kHz can be played. A couple of other details that are likely to appeal are the full-size quarter-inch headphone socket (there's a mini-jack one too) and the real analogue volume control: but what are those phono sockets? They look as if they might be line out, but no, they are digital in and out. Digital out is obvious, digital in less so, but it turns out the Colorfly can be used as a DAC and also as a sample-rate convertor (upsampler). The DAC function makes more sense when you realise that the large headphone socket has an output level of 2V with the volume at maximum, so with a suitable adaptor you can use this as a line-level source. That's a high-res source, don't forget and it's an audio device, not a computer, with all the convenience that implies, plus no moving parts, hence no noise. Memory is 32GB of internal chips, plus a micro-SDHC socket to take cards up to 32GB. At the time of writing, 16GB cards cost about £1 per GB and 1GB is about one hour of 24/96 audio with lossless compression. You'll already have noticed from the photos that this is one smart-looking baby. In fact, in the flesh it's simply gorgeous with its solid walnut body. It's bigger than other portables, but still fits in a jacket pocket and feels fabulous in the hand. Internally it's built with the sort of parts you expect to find in high-end CD players and DACs. And the sound? There's no doubt that this is a whole different ball-game of portable sound. We took advantage of the higher-than-usual output levels and conducted quite a lot of listening with Grado's fabulous GS1000 headphones, which the Colorfly can drive louder than we'd ever want to listen. More importantly, it drove with a combination of grip and sweetness that really does make for a high-fidelity experience. You get the kind of detail that would not disgrace a pretty upmarket CD player heard via a good headphone amp. We did most of our listening with 16-bit/44kHz material because most of the world's recordings come like that, but high-resolution recordings, do show up their advantages through equipment of this calibre. As a component in a domestic hi-fi set-up, the Colorfly also makes a very good impression. Whether playing its own files or acting as a DAC, it achieves performance results that would not embarrass a full-size component of similar price, or indeed rather higher. We ran a few basic lab checks too, and performance is technically excellent, with jitter unmeasurable and distortion very low – exceptionally low, in fact, even when driving a headphone load. This is an astonishingly capable little box.